This week’s Torah portion (Parashat Pekudei) tells us the Tabernacle was put together in the first month of the year (Nissan) and summarizes the construction of the Tabernacle according to the previous chapters. After the Tabernacle was constructed, we are told the following according to Shemot / Exodus 40:33-38, לג וַיָּקֶם אֶת-הֶחָצֵר סָבִיב לַמִּשְׁכָּן וְלַמִּזְבֵּחַ וַיִּתֵּן אֶת-מָסַךְ שַׁעַר הֶחָצֵר וַיְכַל מֹשֶׁה אֶת-הַמְּלָאכָה: פ [מפטיר] לד וַיְכַס הֶעָנָן אֶת-אֹהֶל מוֹעֵד וּכְבוֹד יְהֹוָה מָלֵא אֶת-הַמִּשְׁכָּן: לה וְלֹא-יָכֹל מֹשֶׁה לָבוֹא אֶל-אֹהֶל מוֹעֵד כִּי-שָׁכַן עָלָיו הֶעָנָן וּכְבוֹד יְהֹוָה מָלֵא אֶת-הַמִּשְׁכָּן: לו וּבְהֵעָלוֹת הֶעָנָן מֵעַל הַמִּשְׁכָּן יִסְעוּ בְּנֵי יִשְֹרָאֵל בְּכֹל מַסְעֵיהֶם: לז וְאִם-לֹא יֵעָלֶה הֶעָנָן וְלֹא יִסְעוּ עַד-יוֹם הֵעָלֹתוֹ: לח כִּי עֲנַן יְהֹוָה עַל-הַמִּשְׁכָּן יוֹמָם וְאֵשׁ תִּהְיֶה לַיְלָה בּוֹ לְעֵינֵי כָל-בֵּית-יִשְֹרָאֵל בְּכָל-מַסְעֵיהֶם: 40:33 He erected the court all around the tabernacle and the altar, and hung up the veil for the gateway of the court. Thus Moses finished the work. 40:34 Then the cloud covered the tent of meeting, and the glory of the Lord filled the tabernacle. 40:35 Moses was not able to enter the tent of meeting because the cloud had settled on it, and the glory of the Lord filled the tabernacle. 40:36 Throughout all their journeys whenever the cloud was taken up from over the tabernacle, the sons of Israel would set out; 40:37 but if the cloud was not taken up, then they did not set out until the day when it was taken up. 40:38 For throughout all their journeys, the cloud of the Lord was on the tabernacle by day, and there was fire in it by night, in the sight of all the house of Israel. (NASB) After Moshe had finished putting the Tabernacle together as he was instructed up on the mountain of Sinai, we see the cloud of God’s glory descending upon it. Shemot / Exodus 40:38 suggests that the cloud of God’s presence literally was upon the Tabernacle day and night. The Lord told Moses, “No man may see me and live” (Shemot / Exodus 33:20). This was the reason the Lord only allowed Moshe to see his back side in passing (Shemot / Exodus 33:22–23). We read when the cloud of God’s glory was encountered, men bowed down humbling themselves and they were often unable to approach it (compare Shemot / Exodus 40:34–35, 2 Chronicles 7:2, and 1 Kings 8:11). This was the reason for the manifestation of the cloud, a physical sign of God’s presence because man was not able to see God and live. We read in the Apostolic Writings Yeshua stated that to see and know Him is to see the glory of God the Father. He told His followers in John 11:40, “Did I not tell you that if you believe, you will see the glory of God?” He also said, “Anyone who has seen me has seen the Father” (John 14:9). Yeshua himself stated that if we believe in Him the Lord God Almighty will send His Spirit to dwell in our hearts. From this we understand He has given His children the Holy Spirit, and consequentially we carry the glory of God with us everywhere we go (see 1 Corinthians 6:19 and 2 Corinthians 5:5). The parallel’s to the life of Yeshua, the giving of the Spirit of God, and His presence going with us each day may be found here in this week’s Torah portion. The way this verse is written, it says the “cloud” (הֶעָנָן) covered or concealed (וַיְכַס) the Tent of Meeting and the glory (וּכְבוֹד) of God filled the Mishkhan. So the idea here is the attribute of glory was within the cloud which in turn was within the Mishkhan (Tabernacle). On the mountain of Sinai we are told that Moshe approached the dark cloud within which God was present. Here the Torah states that Moshe was unable to enter into the Tabernacle because the cloud rested upon it and the attribute of glory filled the Tabernacle. This tells us that unless God called Moshe inviting him to enter the cloud, he was not to do so. According to the Book of Hebrews we are told the following, Hebrews 1:1 God, after He spoke long ago to the fathers in the prophets in many portions and in many ways, 1:2 in these last days has spoken to us in His Son, whom He appointed heir of all things, through whom also He made the world. 1:3 And He is the radiance of His glory and the exact representation of His nature, and upholds all things by the word of His power. When He had made purification of sins, He sat down at the right hand of the Majesty on high, 1:4 having become as much better than the angels, as He has inherited a more excellent name than they. (NASB) What is being revealed to us here is how we are being invited to believe in Yeshua the Messiah, to receive God’s Spirit into our hearts, and then being filled with His glory. Nachmanides on Shemot / Exodus 40:35 writes that it is quite possible that the second verse which speaks about the attribute כְבוֹד filling (מָלֵא) the Tabernacle alludes to His glory which resides within that attribute. We find something very similar in connection with the Lord sending His Spirit to dwell within us. According to 2 Chronicles 7:1-2, the construction of the Temple, when Solomon had finished praying (during the consecration ceremonies) fire descended from heaven and consumed the burnt-offering and the meat-offerings, and we are told the attribute of the כְבוֹד of the Lord filled the House. This resulted in the priests being unable to enter the House of the Lord as the attribute of כְבוֹד had filled the House of the Lord. There is a parallel to what we read here with Moshe not being able to enter the Tabernacle. This was what is known as “the Sinai experience of the Jewish people,” describing what the people experienced during the inauguration of the Tabernacle. In the book of Acts, we also see a type of Sinai experience, Acts 2:1 The festival of Shavu’ot arrived, and the believers all gathered together in one place. 2:2 Suddenly there came a sound from the sky like the roar of a violent wind, and it filled the whole house where they were sitting. 2:3 Then they saw what looked like tongues of fire, which separated and came to rest on each one of them. 2:4 They were all filled with the Ruach HaKodesh and began to talk in different languages, as the Spirit enabled them to speak. (CJB) The description of the disciples receiving the Holy Spirit of God, the earth shook, the wind blew, the filling of the house, and tongues of fire resting upon them, the disciples were having a Sinai experience that parallels what has happened with king Solomon and Moshe. The Scriptures we are looking at for this week are from Shemot / Exodus 40:1-38. לעיני כל בית ישראל בכל מסעיהם [THE CLOUD WAS ON THE TABERNACLE] … IN THE SIGHT OF ALL THE HOUSE OF ISRAEL, THROUGHOUT ALL THEIR JOURNEYS — At every מַסְעֵ which they made (according to Rashi this means: at every station at which they stopped) the cloud rested upon the Tabernacle in the place where they encamped. A place where they encamped is also called מַסְעֵ (the literal meaning of which is “journey”). Similar is, (Genesis 13:3) “And he went on to his resting places (למסעיו)“ (cf. Rashi on this verse); similar also is, (Numbers 33:1) “These are the מַסְעֵי” — “the places of encampment”. Because from the place of encampment they always set out again on a new journey therefore all the different stages of their journeys (including the places where they encamped) are called מסעות. The word מַסָע is a noun meaning “journey” and Rashi describes Shemot / Exodus 40:38 as every place the people camped the glory of the Lord would dwell upon His Tabernacle. There is a parallel to 1 Corinthians 10:31 Whether, then, you eat or drink or whatever you do, do all to the glory of God. (NASB) here Paul had a Torah based perspective of the Lord God dwelling in our midst and therefore we are to give glory to God in our journey of life. The nation of Israel saw God’s glory when He came down to meet them on the Mountain of Sinai. Shemot / Exodus 24:17 says, “The sight of the glory of the Lord was like devouring fire on the top of the mount.” (KJV) We read in the prophets that the prophet Habakkuk got a glimpse of that fiery glory of God too. He described it as like the sun, blazing in the sky saying, “His brightness was as the light; he had horns [or shafts] coming out of his hand: and there was the hiding of his power” (Habakkuk 3:4). It was by the same power of God that raised Yeshua from the dead. This was the glory of God that manifested itself as fire by night and a cloud by day in the wilderness (Shemot / Exodus 13:21). It may be suggested This same glory separated Israel and the land of Goshen from the rest of Egypt when there was light in the land of Goshen, but not in Egypt (Shemot / Exodus 10:23, כב וַיֵּט מֹשֶׁה אֶת-יָדוֹ עַל-הַשָּׁמָיִם וַיְהִי חֹשֶׁךְ-אֲפֵלָה בְּכָל-אֶרֶץ מִצְרַיִם שְׁלֹשֶׁת יָמִים: כג לֹא-רָאוּ אִישׁ אֶת-אָחִיו וְלֹא-קָמוּ אִישׁ מִתַּחְתָּיו שְׁלֹשֶׁת יָמִים וּלְכָל-בְּנֵי יִשְֹרָאֵל הָיָה אוֹר בְּמוֹשְׁבֹתָם:). What was that light (אוֹר)? Was this the glory of God’s presence? Note how the text writes וַיְהִי חֹשֶׁךְ-אֲפֵלָה בְּכָל-אֶרֶץ מִצְרַיִם שְׁלֹשֶׁת יָמִים saying there was darkness in all of the land of Egypt, but yet there was light in Israel. The most likely cause of this is due to the presence of God’s glory! The rabbis say that the attribute of mercy belongs to the day and the attribute of justice belongs to the night in relation to the glory of God descending and dwelling upon the Mishkhan. What this teaches us is that the Torah consists both of the attribute of Mercy and the attribute of Justice. The rabbis say that this is how the Torah is divided, the Written Torah and the Oral Torah (Mishnah) as the attribute of Mercy and Justice, respectively. 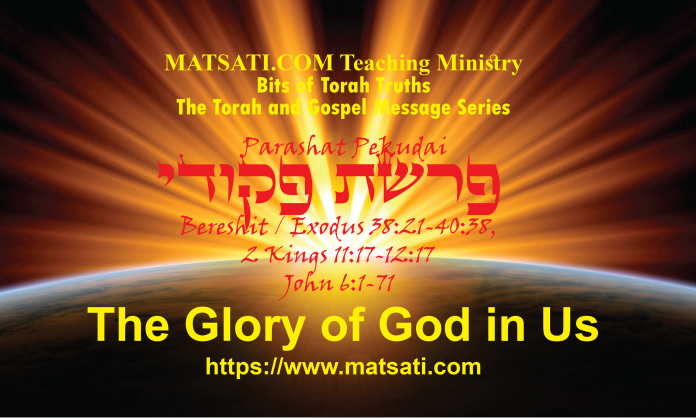 Because of the cloud of the glory of God dwelling upon the Tabernacle (Mishkhan), and the attribute of Mercy and Justice, we get the idea that the Shekhinah glory of God cleaving to God’s people. The Ohel Moed (Tent of Meeting) is connected here to both the Shekhinah of God and the people dwelling in tents where Bilam spoke of the glory of the tents in Bamidbar / Numbers 24:8 saying “how goodly are your tents oh Jacob” and what we read in Parashat Ki Tisa (Shemot / Exodus 33:8) of “each man stood at the entrance to his tent” when Moshe went to the Tabernacle. This speaks of the present reality of our high priest Yeshua the Messiah entering into the Tabernacle in heaven and making atonement on our behalf, and the Shekhinah glory of God dwelling in our midst. Note how the Children of Israel adjust their journeys in the desert to the movements of the cloud. This is what the rabbis call the הִדָבְקוּת, “the adhering or cleaving” of the Shekhina to God’s people. Here in Shemot / Exodus 40:38 For throughout all their journeys, the cloud of the Lord was on the tabernacle by day, and there was fire in it by night, in the sight of all the house of Israel. (NASB) the cloud is associated with כָל-בֵּית-יִשְֹרָאֵל בְּכָל-מַסְעֵיהֶם, “the entire house of Israel in all their journeys.” The Children of Israel were mentioned twice in close succession seeing that the Torah had mentioned both the cloud (glory) and the fire of God. The visibility of the cloud, of the glory of God to all the people testifies to the purity and sanctity of all the people at that time. These things teach us how in the Messiah Yeshua, we too receive a Sinai experience just as the people have received here. In John 14:15-31 we are told how Yeshua Promises the power and the presence of God through the Holy Spirit “If you love me, you will keep my commands.” (John 14:15) Our Father in heaven will send His presence into our lives through His Spirit in Yeshua’s name (15:26) and Yeshua told us this before it happens so that we will believe (15:29). By the Spirit of God indwelling us, His Shekhinah will go with us and we will adjusted our journey according to the leading of God’s Spirit just as we see is happening here in the wilderness journey. Parashat Pekudei is a fantastic picture of what God is doing in our lives in His desire to dwell in our midst. It is in this way that the Torah and the Gospel Message are intimately connected! Parashat Vayechi, The Lion of the Tribe of Judah.